It was perhaps one of the most anticipated games of the season, and it lived up to the hype. In a historic rivalry game and potential playoff preview, the Toronto Maple Leafs were visitors against the Montreal Canadiens in an absolutely raucous Bell Centre. In his first Leafs-Habs game, John Tavares also played the OT hero, scoring backhand on Carey Price after a slick pass from Mitch Marner. Afterwards, he was complimentary of both fanbases in the build-up to this game, describing an incredible atmosphere for the rivalry game. "It means a lot to the fabric of both communities. You can see the passion from both fan bases & from both teams as well ... the game was played at a very high level. You could see the competitiveness & everyone fighting for every inch"
John Tavares: "It was a lot of fun. My first time in a Leafs-Canadiens game here ... these are pretty cool because so much history between the teams ... such a great hockey city so fun to be a part of it, especially on a Saturday"
"Once you get to this point of the season & you see where they are in the standings, it's no fluke. They obviously have an identity to their team. They're playing well. They're playing with confidence & they're getting results." Not only was this a potential playoff preview, but these two teams are deadlocked for second in the Atlantic Division behind the runaway Tampa Bay Lightning. 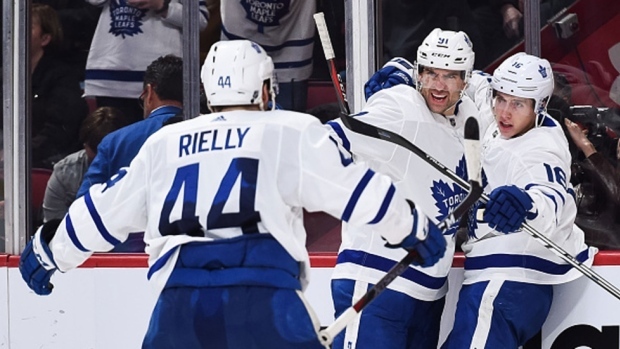 With the win, Leafs improve to 71 points on the season, while the Habs salvaged a point in the overtime loss to stay right on Toronto’s heels with 69 points. Mark your calendars: Before the playoffs come, we’ll see these teams meet two more times, including again this month when the Canadiens come to Toronto on the 23rd. After that? They’ll also face off on the last day of the regular season, and if by chance they’re still jockeying for playoff position, that game is definitely going to be one to look out for — maybe even as something of a “Game 0” before the playoffs start for real. Leafs coach on the fans tonight: "They were ready to go"